Lake Superior is the largest freshwater lake in the world by surface area and the second largest by volume. The North Shore of Lake Superior is a rocky shoreline is beautiful, but often treacherous. Canoes are not recommended, sea kayaks are better suited to these unprotected and often windswept waters. The Weather - Veteran users of the lake will tell you that when the weather turns for the worse, Lake Superior can become extremely hazardous for vessels of any size. Even in moderate weather, the lake is no place for an inexperienced or unprepared boater. The weather can and does change suddenly on the Lake Superior and it's no place for any vessel during a storm. 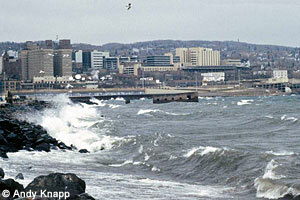 Even skippers of ocean-going freighters have learned to respect Lake Superior storms. With this in mind, the DNR has developed several accesses, campsites, rest areas and emergency take-outs for kayakers. Lake Superior safety information. Hypothermia - (the lowering of the body's core temperature) is an ever-present danger on Lake Superior. A drop in the body's core temperature of more than 20 degrees F can kill you. Except for shallow bays and beaches, the water temperature in the lake seldom reaches 55 degrees F., even during the hottest summer weather. Survival time in the lake, without a life jacket is, on average, less than two hours. Wear a U.S. Coast Guard approved life jacket when you are on the lake. If you do fall in, they will not only float you, but help retain body heat, particularly the vest and full-sleeved models using polyvinyl foam for flotation. Gooseberry Falls State Park - is the gateway to the North Shore. It is known for its spectacular waterfalls, river gorge, Lake Superior shoreline, Civilian Conservation Corps log and stone structures, and north woods wildlife. Split Rock Lighthouse State Park - Northeast of Gooseberry lies Split Rock Lighthouse. Here, several bays are publicly owned and open to paddlers. After Corundum Point, you'll catch sight of Split Rock Lighthouse, perched high above a lake on a sheer cliff. The lighthouse is one of the most imposing and beautiful on the entire lake. A Minnesota historic site, it is open for tours. 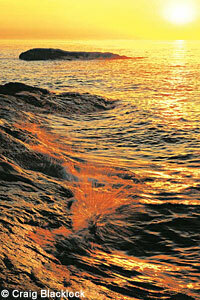 Visitors can cart-in their supplies to pristine campsites along Lake Superior. Scenic trails along the lake link up to the spectacular Superior Hiking Trail. Anglers cast their lines for lake trout, salmon, and brown trout. Tettegouche State Park - is the largest and perhaps most varied of Minnesota's state parks along the shore. You can land and walk to the cart-in campground-as well as gain access to the extensive network of hiking trails that lace the park. At the very least, paddle into the estuary of the Baptism. You may have to drag up a small, gravelly rapids for an impressive view of the rugged cliffs that flank the lower river. George Crosby Manitou State Park - has a wilderness of fir, cedar, spruce and northern hardwoods to explore. The beautiful old-growth stands are protected as part of a Scientific and Natural Area. Waterfalls and Benson Lake add to the enjoyment of visitors who come to this park to get away from crowds. This park is inland from the Lake Superior shoreline, but is a great destination for hike-in camping. 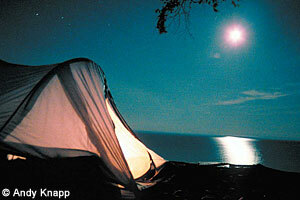 Temperance River State Park - At Temperance River, visitors come to camp and picnic along the shore of Lake Superior. A campsite may be occupied by a group of six or fewer people using one camping shelter. The variety of plant communities in the park provides habitat for many different types of wildlife species. Cascade River State Park - Aptly named, the Cascade River flows down one ledge after another for a total drop of 900 feet in three miles of its journey to Lake Superior. The park setting is a boreal hardwood-conifer forest of aspen, birch, fir, spruce and cedar. Visitors can stand on the footbridge that spans the river, or at any of the viewing spots above the river, and feel the vibration of the rushing torrent of water as it cascades down a volcanic canyon. Judge C.R. Magney State Park - The most popular hike leads from the trailhead upstream along the Brule River to Devil's Kettle, where the river splits around a mass of volcanic rock. Half of the river plunges 50 feet into a pool, while the rest pours into a huge pothole. Anglers can catch brook and rainbow trout in the Brule River or its tributary, Gauthier Creek. The park offers camping, picnicking and hiking. Grand Portage State Park - To American Indians, voyageurs and fur traders in the 1700s, the natural features of this area were an awesome sight. Travelers and traders were faced with a 120-foot waterfall, the thundering rapids of the Pigeon River, cliffs, and rocky terrain that was impossible to cross. The only option was to go around these obstacles. The nine-mile trek became known as "The Grand Portage" and ultimately gave the area its name. The park lies within the Grand Portage Indian Reservation and is bordered by Canada on the north and east. The park lies about one mile west of Lake Superior. Agates - Some say Lake Superior agates are the oldest in the world. Visitors like to search for them, and anyone can appreciate the remarkable colors and intricate patterns of the wave-polished stones. Collectors value rocks for their size and unusual markings. A rock and mineral show is good place to see many different agates. Lake trout, the most prevalent game fish, retreat to very deep water during the summer, when most paddlers are on the lake. Your best chance for success comes in spring and fall, when lake trout occupy shallower water near shore. Troll a spoon or deep-diving plug as you paddle. You might also hook steelhead (migratory rainbow trout), which ascend tributary streams in the spring, or pink and chinook salmon, which appears at stream mouths in fall. A few brown trout inhabit the lake and may lurk at river mouths throughout the year. You may catch trout-usually small rainbows with a few brook trout-by fly-fishing the lower reaches of small tributaries to the lake. The trails in the parks are carved through a forest of fir, cedar, spruce, and northern hardwoods home to a variety of animals such as moose, deer, bear, and wolves. The North Shore's cultural history and diversity is no less impressive. The North Shore offers the paddler an opportunity to learn about the people and traditions of the First Nations of the lake and the European influence of early explorers, missionaries and fur traders. Evidence of the history of the lumber, mining, shipping, and the commercial fishing industry is found all along the shore.